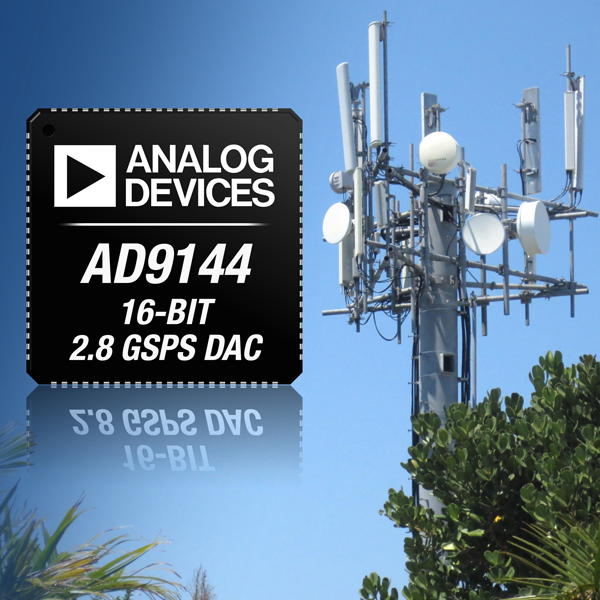 The AD9144 is a four-channel, 16-bit, 2.8-GSPS DAC that supports high data rates and ultra-wide signal bandwidth to enable wideband and multiband wireless applications. The DAC features 82-dBc spurious-free dynamic range (SFDR) and a 2.8-GSPS maximum sample rate, which permits multicarrier generation up to the Nyquist frequency. With –164-dBm/Hz noise spectral density, the AD9144 enables higher dynamic range transmitters to be built. Its low SFDR and distortion design techniques provide high-quality synthesis of wideband signals from baseband to high intermediate frequencies. The DAC features a JESD204B eight-lane interface and low inherent latency of fewer than two DAC clock cycles. This simplifies hardware and software system design while permitting multichip synchronization. The combination of programmable interpolation rate, high sample rates, and low power at 1.5 W provides flexibility when choosing DAC output frequencies. This is especially helpful in meeting four- to six-carrier Global System for Mobile Communications (GSM) transmission specifications and other communications standards. For six-carrier GSM intermodulation distortion (IMD), the AD9144 operates at 77 dBc at 75-MHz IF. 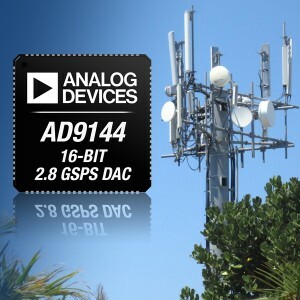 Operating with the on-chip phase-locked loop (PLL) at a 30-MHz DAC output frequency, the AD9144 delivers a 76-dB adjacent-channel leakage ratio (ACLR) for four-carrier Wideband Code Division Multiple Access (WCDMA) applications. The AD9144 includes integrated interpolation filters with selectable interpolation factors. The dual DAC data interface supports word and byte load, enabling users to reduce input pins on lower data rates to save board space, power, and cost. The DAC is supported by an evaluation board with an FPGA Mezzanine Card (FMC) connector, software, tools, a SPI controller, and reference designs. Analog Devices’s VisualAnalog software package combines a powerful set of simulation and data analysis tools with a user-friendly graphical interface that enables users to customize their input signal and data analysis. The AD9144BCPZ DAC costs $80. The AD9144-EBZ and AD9144-FMC-EBZ FMC evaluation boards cost $495.